All eyes are on Tesla once more, after a Model S traveling at highway speeds crashed into a parked fire truck in Culver City, California earlier this week. The collision, which allegedly happened while the car was on Autopilot, has incited renewed debates, criticisms, and an upcoming government probe on Tesla and its evolving driving-assist software. As more details about the accident emerge, here is a brief discussion on the latest and most pertinent information relating to the recent Model S collision. 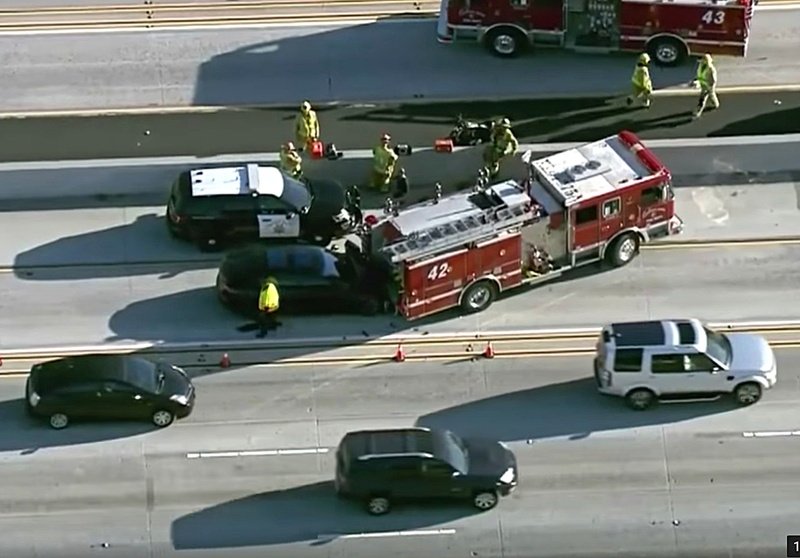 As we stated in a previous report, the Tesla Model S was traveling at 65 mph on Interstate 405 on Monday morning when it crashed into a stationary fire truck. The emergency vehicle was parked on the road after being deployed to a separate accident in the area. The driver of the electric car was able to walk away unharmed from the accident. 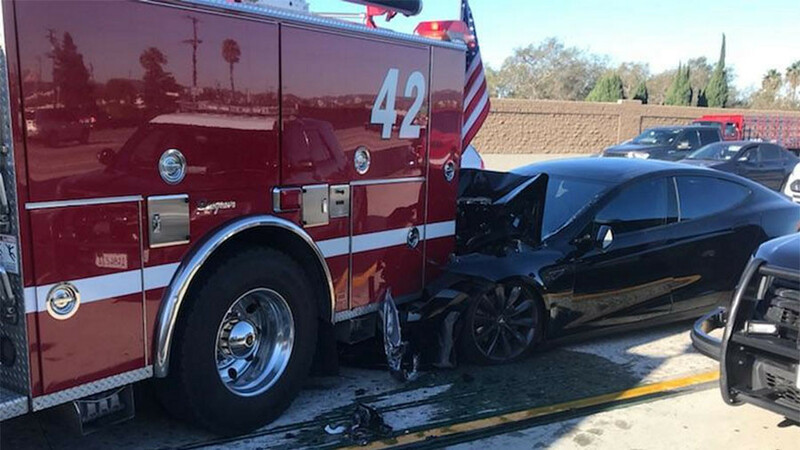 Upon being questioned by the authorities, the Model S driver stated that the vehicle was on Autopilot when it collided with the parked fire truck. Tesla released a brief statement on Monday, stating that Autopilot is intended only to be used by an attentive driver. As the online forum community continued to debate about the benefits and risks of Tesla’s Autopilot software, a member of the r/TeslaMotors subreddit who claimed to know the driver of the crashed Model S spoke up and provided some details about the accident. According to the Redditor, the Model S was traveling behind a pickup truck with Autopilot engaged. Due to the truck’s size, the Tesla’s driver was unable to see beyond the vehicle in front. “The driver of the Tesla is my dad’s friend. He said that he was behind a pickup truck with AP engaged. The pickup truck suddenly swerved into the right lane because of the firetruck parked ahead. Because the pickup truck was too high to see over, he didn’t have enough time to react.” notes mikhpat. Tesla’s Autopilot system allegedly did not have enough time to react while driving at 65 mph. The driver stated that the Model S’ emergency braking system might have activated moments before the car hit the emergency vehicle, but he could not be certain, according to mikhpat‘s statement. The impact was strong enough to push the steering wheel two feet into the cabin, however. The Model S driver had some minor cuts and bruises from the accident but was otherwise unharmed. According to the Redditor, the driver admits that he was at fault for not paying close attention to the road. The Model S owner also refused to blame Tesla for the accident. While it’s still unconfirmed if Tesla’s Autopilot suite, including Traffic-Aware Cruise Control and Autosteer, was activated at the time of the accident, Tesla’s Model S Owner’s Manual warns of a similar scenario that would not be detected by the driving-assist system. The warning appears to mimic the exact situation being described by Redditor mikhpat. As the online forum community exploded amidst heated debates on who is to blame for the recent Model S collision, the US National Transportation Safety Board announced that it is sending two of its investigators to California to study the crash. According to the NTSB, the investigators will be examining both “driver and vehicle” factors in Monday’s accident. By Tuesday, the National Highway Traffic Safety Administration announced that it is also sending a team of investigators to California to evaluate the recent accident, as well as to assess any “lessons learned” from the crash, as noted in a Bloomberg report. The NHTSA did not specify which team of investigators it was sending to California, but expectations are high that the regulating body would be deploying its Special Crash Investigations unit.